Laura Geller Fifty Kisses Lip Locking Liquid Lip Colour is a long-wearing liquid lipstick range that promises to stay put through 50 kisses, launched in early 2017. There are eight shades available. I have two of them to show you, and will be showing you a third one shortly. The shades I picked are Ravishing Rose and Melon Crush. 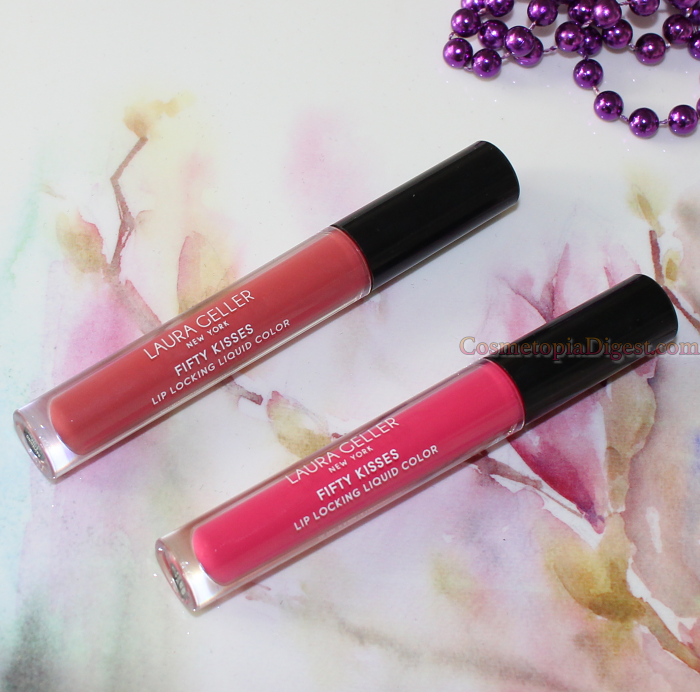 Scroll down for the review and swatches of the Laura Geller Fifty Kisses Lip Long Liquid Color. The packaging is very similar to the old Revlon Colorstay Ultimates. The formula, though, is way nicer. The applicator is a regular doe-foot. So far, nothing that sets this one apart, you say? 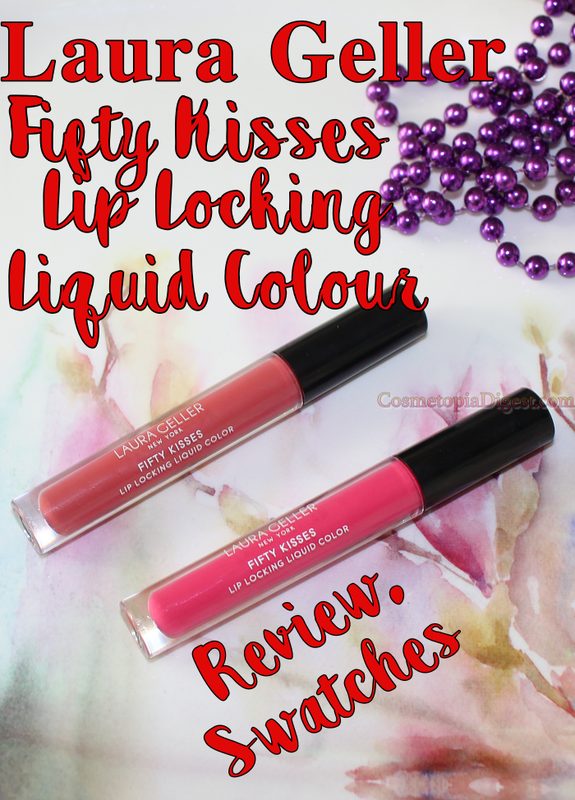 These lippies are very lightweight and liquid-y and glide on beautifully. Work fast - these dry quickly, unlike the Huda lippies. The formula is very thin - so much so that you fear for the pigmentation. But no worries there - pigmentation is 100%. The staying power is brilliant. LG claims these will last through fifty kisses (from a morning peck till a midnight smooch) of unspecified duration and intensity! These are even less drying than the Jouer Long Wear Lip Cremes (reviewed here) - I would say they are very similar to the Huda Lip Mattes (reviewed here) as far as drying is concerned, though these do not transfer, unlike the Huda lippies. I'm going to commit what you might call sacrilege here, and state that these are smoother and lighter than the Urban Decay Vice Liquid Lipsticks. I have a bad habit. Be it foundation or lip colour, I presume that all shades and swatches I see - whether in store lighting or online - are too light (i.e., whatever shade logic and the SA say is right for me, is probably too light), and then I "err on the side of caution" when I buy. Only to find that I've erred all right, and the shade is too deep. It has happened time and again, and this range is no exception to my go-one-shade-deeper-than-you-think-because-you're-wrong idiocy. 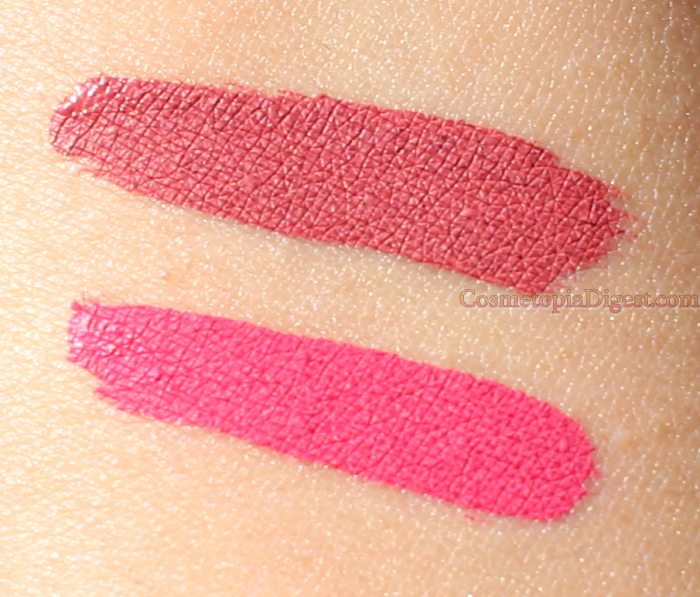 Here are swatches on bare skin - Ravishing Rose is on top. Melon Crush is below. These oxidise a bit as they dry, so do not be taken in by the colours in the tubes. Do not be taken in by fresh swatches either. They are going to get darker on the lips. On-lips swatches are on bare, unexfoliated skin without lip liner, primer, balm or gloss. While both are in natural outdoor light, the first one was taken after the rains began - we won't have sunny days until mid-August. Ravishing Rose (left) is neither dusty nor rose nor mauve. It is a brownish-berry, and reminds me of Charlotte Tilbury Matte Revolution Walk of Shame. Melon Crush is a BRIGHT pink, reminiscent of Too Faced Melted Fuchsia. Brill. These are top class liquid lipsticks. Lightweight, opaque formula that goes on smoothly and does not squeeze out every bit of moisture from the lips. You can get away without much lip-prepping and tlc. At £17 per lipstick, these don't break the bank either. Liquid lipsticks have come a long way from the days of the super-drying, flaky MAC Pro Longwear and Max Factor Lipfinity, both of which used to break up on the lips after a while. I haven't revisited either range in years, but there are so many affordable and sinless options out there now. I'm planning to get Laura Geller's Beige Bite next!